Have many holiday pictures and want to organize your photos? Yes, we offer you comprehensive picture manager of Google Photos using location. MyFotoPlaces is built around Google Drive/Photos, so you can find and organize your images by the location. While Google Drive provides excellent service for storing your photos, it is not easy to browse, find and organize your pictures. 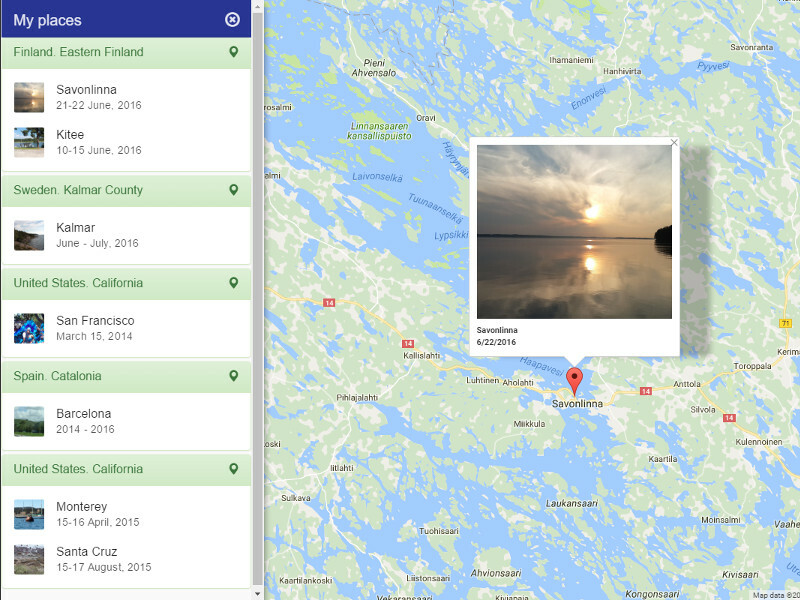 With MyFotoPlaces you organize pictures using location and visualize on map. You can pin pictures into location to quickly find memorable pictures anytime. Geotagged pictures automatically shown in their location. Features - Search and group your Google Photos using saved geotagging and show pictures on the Google map - Manage location of Google Photos by pinning pictures into a location - "My Places" panel shows the location of your pictures and provides quick navigation to the place - Zoom in the map to show more details, e.g. picture taken near to a landmark, or zoom out to see high level, e.g. pictures snapped in a town or country. - Quick photo preview on the Google map - you can fast find interesting foto in the place - Photo gallery view of your pictures in the selected place - Film strip navigator for quick access across your pictures in the place - Full screen or slideshow view of pictures: easy to view and easy to show! - The location address of place and date when picture was snapped - Zoom in and zoom out pictures to see its details - Quickly share the found picture with your friends - MyFotoPlaces is optimized for Web and Mobile Web Frequently Asked Questions Q: How MyFotoPlaces knows location of my pictures? A: It uses geotagging. When you take picture a camera stores the current location inside of the image. If you disable location service you can still pin manually pictures on map. Q: What is my camera doesn't support Geotagging? A: No problems! You can select and pin pictures into locations.